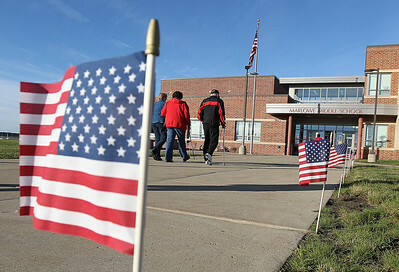 H. Rick Bamman - hbamman@shawmedia.com People arrive Friday, Nov. 11, 2016 at Marlowe Middle School for the annual Veterans Day recognition program in Lake in the Hills. H. Rick Bamman - hbamman@shawmedia.com Marlowe Middle School sixth graders Olivia Zak (front) Gina Cutrona served breakfast to veterans and guests Friday, Nov. 11, 2016 during the annual Veterans Day recognition program in Lake in the Hills. 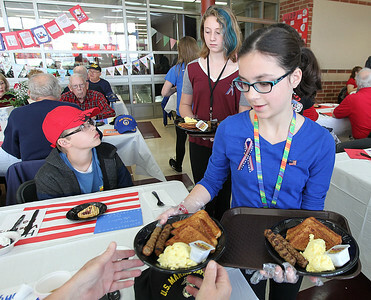 H. Rick Bamman - hbamman@shawmedia.com Marlowe Middle School sixth grade server Madison Fromm delivers a breakfast to a guest Friday, Nov. 11, 2016 during the annual Veterans Day recognition program in Lake in the Hills. 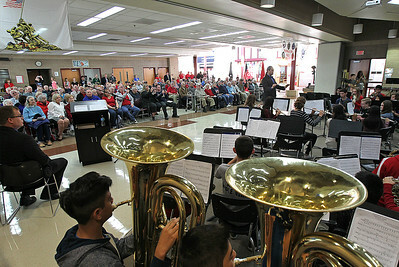 H. Rick Bamman - hbamman@shawmedia.com Veteran Ralph Drafall attened the Marlowe Middle School annual Veterans Day recognition program in Lake in the Hills. 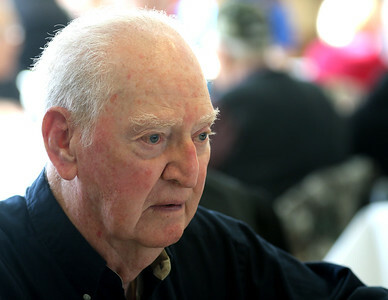 Drafall served during WWII as an Army Medic. H. Rick Bamman - hbamman@shawmedia.com Air Force veteran Pat Brady attened the Marlowe Middle School annual Veterans Day recognition program in Lake in the Hills Brady served in Korea. 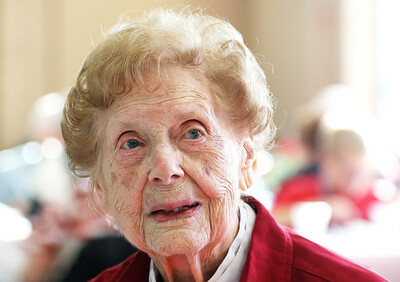 H. Rick Bamman - hbamman@shawmedia.com Marlowe Middle School namesake 100 year old Helen Marlowe attened the annual Veterans Day recognition program in Lake in the Hills on Friday, Nov. 11, 2016. 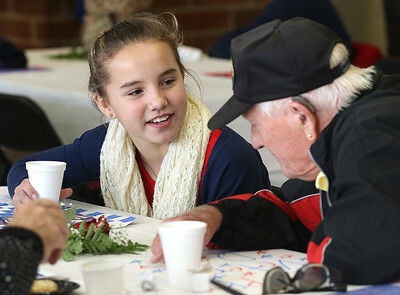 H. Rick Bamman - hbamman@shawmedia.com Marlowe Middle School sixth grader Olivia Pawlak and Marine veteran Richard Christie talk after breakfast Friday, Nov. 11, 2016 during the annual Veterans Day recognition program in Lake in the Hills. 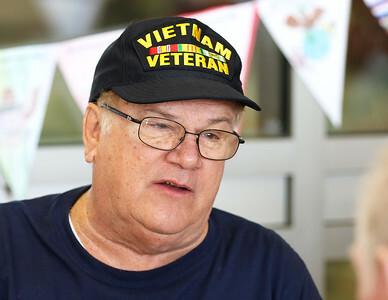 H. Rick Bamman - hbamman@shawmedia.com Vietnam Army veteran John Cizowski enjoyed the Marlowe Middle School breakfast and annual Veterans Day recognition program in Lake in the Hills. 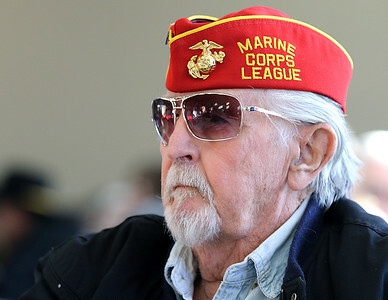 H. Rick Bamman - hbamman@shawmedia.com Marine Veteran Rick Loughran served during WWII served in the 6th Division, 4th Marine Raider Battalion in the south pacific atteneded on Friday, Nov. 11, 2016 the Marlowe Middle School annual Veterans Day recognition program in Lake in the Hills. 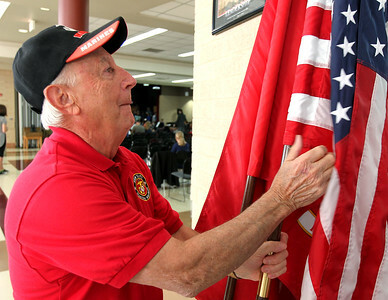 H. Rick Bamman - hbamman@shawmedia.com Huntley/SunCIty Marine Color Guard member Joe Scorn readies flags for the presentation of colors at the Marlowe Middle School annual Veterans Day recognition program in Lake in the Hills. 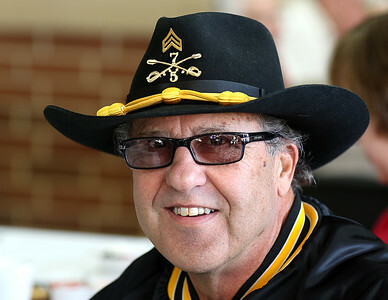 H. Rick Bamman - hbamman@shawmedia.com Vietnam Army veteran Duane Engel attened the Marlowe Middle School annual Veterans Day recognition program in Lake in the Hills on Friday, Nov. 11, 2016. 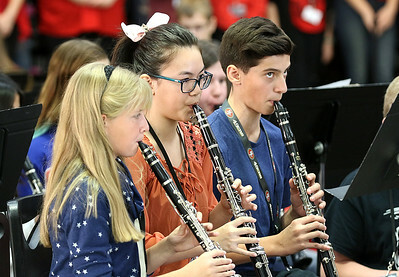 H. Rick Bamman - hbamman@shawmedia.com Marlowe Middle School band performed as the school welcomed veterans and guests on Friday, Nov. 11, 2016 during the Veterans Day recognition program in Lake in the Hills. H. Rick Bamman - hbamman@shawmedia.com Members of the Marlowe Middle School band performed for veterans and guests on Friday, Nov. 11, 2016 during the annual Veterans Day recognition program in Lake in the Hills. 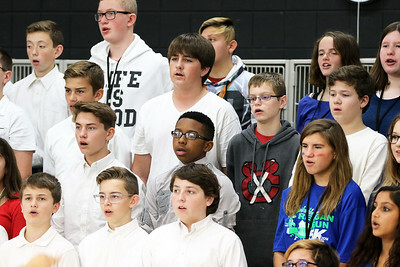 H. Rick Bamman - hbamman@shawmedia.com Memebers of the Marlowe Middle School chorus perform Friday, Nov. 11, 2016 during the annual Veterans Day recognition program in Lake in the Hills. 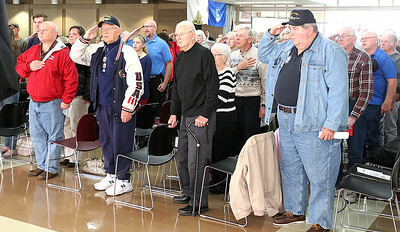 H. Rick Bamman - hbamman@shawmedia.com Veterans and guests stand for the National Anthem Friday, Nov. 11, 2016 at Marlowe Middle School during the annual Veterans Day recognition program in Lake in the Hills. 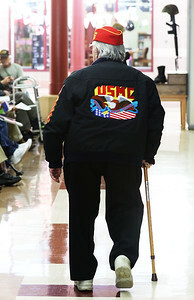 H. Rick Bamman - hbamman@shawmedia.com Marine Veteran Rick Loughran walks to his seat before the start of the Marlowe Middle School annual Veterans Day recognition program in Lake in the Hills. 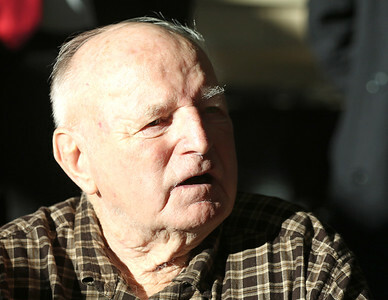 Loughran served during WWII served in the 6th Division, 4th Marine Raider Battalion in the south pacific. 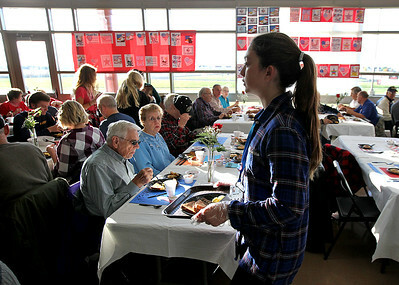 Marlowe Middle School sixth grade server Madison Fromm delivers a breakfast to a guest Friday, Nov. 11, 2016 during the annual Veterans Day recognition program in Lake in the Hills.